In 2018, solar water heater suppliers headquartered in Europe were more satisfied with sales than those not located on the continent. In all, 78 % of the former saw a strong or slight increase in sales volume last year compared to 2017. Elsewhere, the same was true for only 51 % of all businesses. Thriving export markets were Spain and Italy. 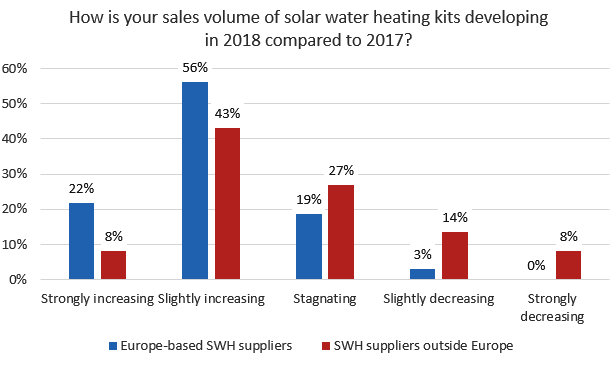 These are some of the results of a survey carried out by German market research agency solrico in November/December 2018 among the world’s suppliers of solar water heaters (SWHs). Seventy-eight companies, more than half of which were not based in the EU, responded to solrico’s questionnaire. The industry survey was also featured in this news article and here. Three of four companies based in Europe were extremely or very satisfied with their sales volumes in 2018. Outside Europe, the positive mood was shared by only every tenth SWH company. Technology suppliers outside Europe were located on any other continent, as 14 were based in Asia, 12 in Africa and the Golf region, 7 in Latin America and 5 in the USA. The survey described SWHs as being small residential solar thermal systems which are installed in single-family homes and use either circulating pumps or natural convection. Several of Europe’s suppliers said that new products and access to new markets had been the driving forces behind sales last year. For example, the solar thermal industry in Greece managed to increase exports by 20 %, according to the latest figures provided by Greece’s solar industry association EBHE. Across the solar thermal industry, exports had already grown as much as 41 % in the previous year. Of the 78 companies participating in the survey, 75 % were exporting part of production. Only every fourth was selling on the national market. 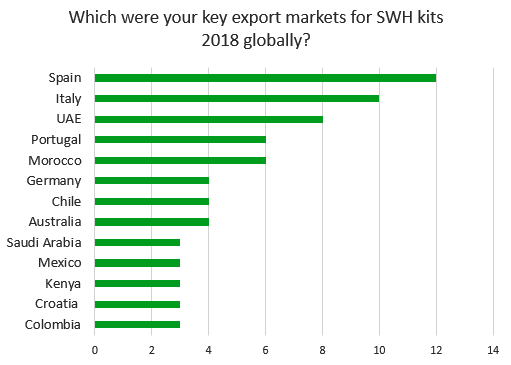 When asked to list the three countries that had been the company´s key SWH export markets in 2018 globally, the suppliers gave a wide variety of answers. The countries shown in figure 2 were mentioned at least three times on the filled-in questionnaires. At the top of the list, there are two incentive-heavy markets, Spain and Italy, followed by the United Arab Emirates, which was mentioned eight times. When respondents were asked why business in the UAE was positive, they pointed to mandatory solar thermal regulations in some emirates. Two companies each named emerging markets such as Egypt, Indonesia, Nigeria, Romania and Yemen. SWH systems are sold globally, as reflected in the long list of export countries given by just one single company. Regarding markets which are about to open up, suppliers listed mainly those in Africa, such as Tanzania, Rwanda, Mali and Benin. Surprisingly, India, despite being a key export market for Chinese companies, was named by only one of six Chinese solar water heater manufacturers. It seems as if Chinese manufacturers think global of their business too and take into consideration countries such as Argentina, Australia, Mexico, South Africa and Vietnam. When asked about the reasons for high sales in a particular country, the suppliers mentioned “strong local distributor partnerships”, an “established customer base”, “effective representation” or a “wide network of partner companies”. It seems that general factors are as important as policy to successful exporting. The manufacturers also mentioned another reason for good business abroad, namely that they were entering new markets with high-quality products.